In our series of brief updates on topics featured in previous Geo-Mexico posts, we look this week at the continuing eruption of two major volcanoes: Popocatapetl Volcano (between Mexico City and Puebla) and Colima Volcano (on the Jalisco-Colima state border in western Mexico). Since our previous post, about a year ago, entitled Alert level rises as Popocatepetl volcano starts to erupt, Popocatapetl Volcano (photo) has continued to be active, with up to 250 activity events a day. The alert level has been reduced slightly to Yellow Phase 2, the fourth highest level. This level indicates intermediate scale explosive activity and possible expulsion of lava, explosions of increasing intensity and wind-blown ash falling on nearby villages. The volcano is monitored daily, and updates from CENAPRED (in Spanish and English) are issued every 24 hours. The report issued on 27 March is typical of recent months. In the previous 24 hours, there were 83 low intensity events with emissions of gas, water vapor and ash. The two largest events sent material rising 1000 meters and 600 meters into the atmosphere respectively, before the wind blew the material north eastwards (away from Mexico City). In January 2013, we reported how Colima Volcano erupts, destroying lava dome first created in 2007. The volcano has continued to erupt in the ten weeks since then. The experts monitoring the volcano have reported up to 200 eruptive events a day, with numerous minor emissions of lava. Local villagers have been asked to remain on alert, though the experts are not yet calling for any villages to be evacuated. 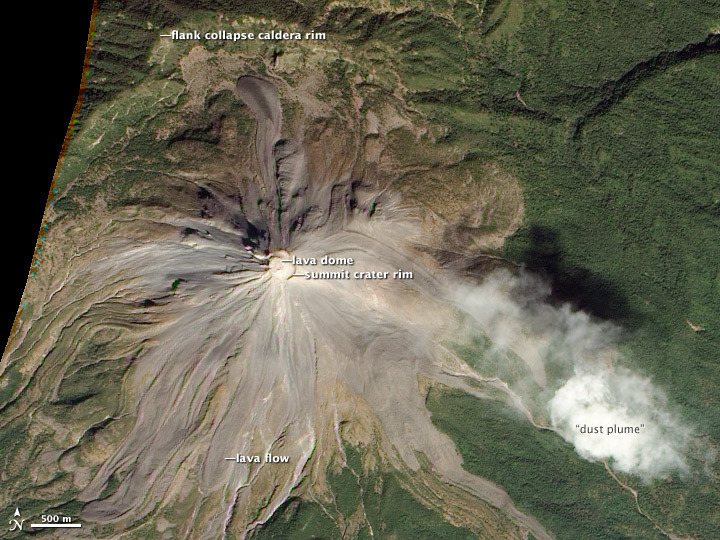 (Note that the 2013 eruptions have significantly altered the top of the volcano since this image was taken). The elevation of Colima Volcano is officially given as 3820 m (12,533 ft) above sea level. In the past 400 years, it has been the most active volcano in Mexico, having erupted at least 30 times since 1576. It is also considered to be one of the country’s most dangerous volcanoes. Numerous villages in its shadow keep a wary eye on its level of activity, and emergency evacuations have become a regular event in the past fifty years. Colima Volcano forms new crater, 11 Jan 2013. Photo: Edo de Jalisco Protección Civil. 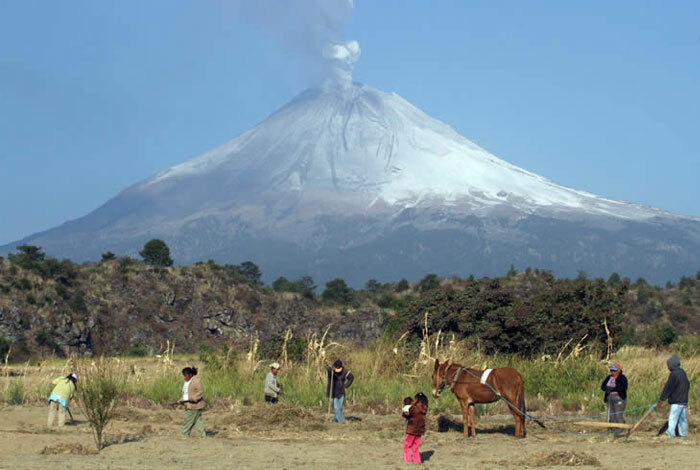 On a geological time-scale, the volcano first erupted about five million years ago in the Pliocene period, long after activity ceased at the nearby, and higher, Nevado de Colima. It quickly developed into a large volcano which partially blew apart or collapsed during Pleistocene times to form a caldera, five kilometers across. A new cone developed inside the caldera. 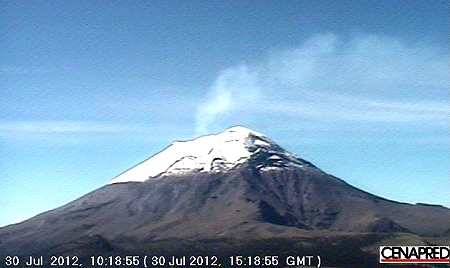 This is the Volcán de Fuego we see today. The cone is built mainly of pyroclastic materials (ashes and volcanic bombs) of andesitic composition together with some basaltic lava, making it a classic example of a composite volcanic cone. Historically, the eruptions of the volcano have fallen into a definite cyclical pattern with periods of activity, each lasting about 50 years, interspersed with periods of dormancy. 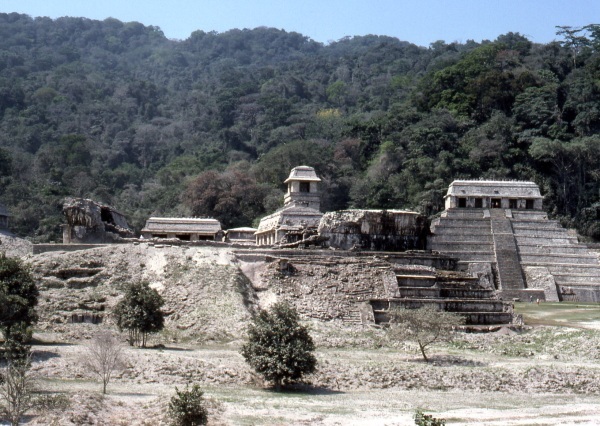 The first cycle of activity (after the Spanish arrived in Mexico) was between 1576 and 1611. Major eruptions occurred in 1680 and 1690, and further complete cycles occurred between 1749 and 1818, and from 1869 to 1913. Most geologists agree that current activity is part of the fifth cycle, which began in 1961. A three year sequence of prior activity (2003 to 2005) is shown on this series of NASA satellite images. As on several previous occasions, once the subterranean pressure that caused the activity has been relieved, activity should cease, and the volcano will enter another less dangerous dormant phase. Even during this phase, a plume of hot gas often billows out from the volcano. The dome that was destroyed in January 2013 began to build in 2007. The explosive activity on 6 January and 10 January 2013 left behind a new crater 220 meters (720 ft) across and about 50 m (165 ft) deep. 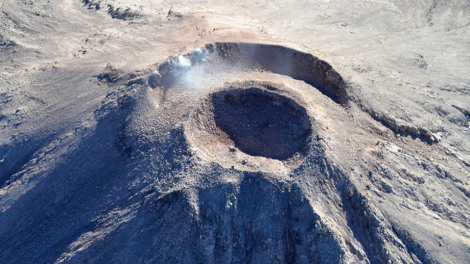 According to the Jalisco-Colima Scientific Committee (which oversees the hazard analysis posed by the volcano), the events of 6 and 10 January emitted an estimated 1.5 million cubic meters of material, which formerly formed the dome. 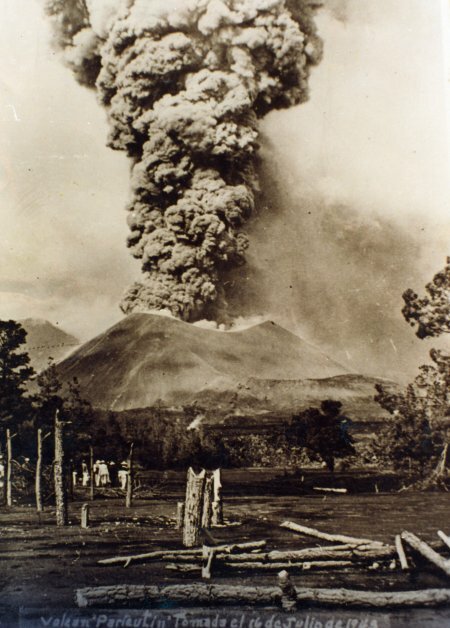 The 10 January explosion, which occurred at 21:40 hrs local time, sent incandescent material down the west flank of the volcano. 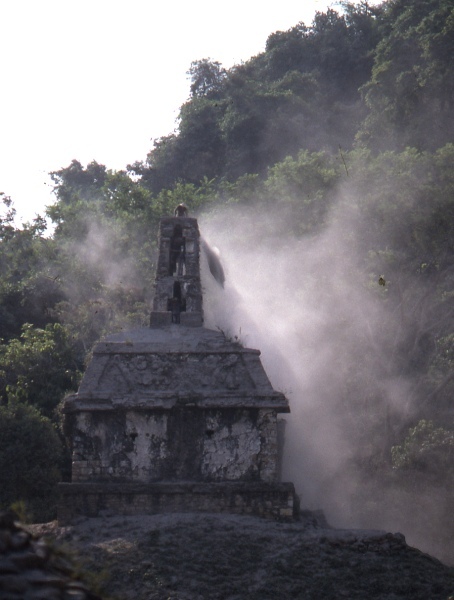 An ash column rose about 3000 meters into the air before traveling north-eastwards on the wind towards the city of Ciudad Guzmán. Thermal imaging shortly after the 10 January explosion showed that the temperatures in the crater are below 200 degrees Centigrade, which indicates relatively little gaseous build up and limited risk of further major explosions. Even so, a prudent 7.5 km exclusion zone is being maintained around the volcano. Another explosion at 3:58 am on 29 January 2013 created a plume of ash and cinders that rose more than 3000 meters above the volcano. The ash fell of nearby villages, including Los Mazos, Ejido Atenquique, Tuxpan and Huescalapa. 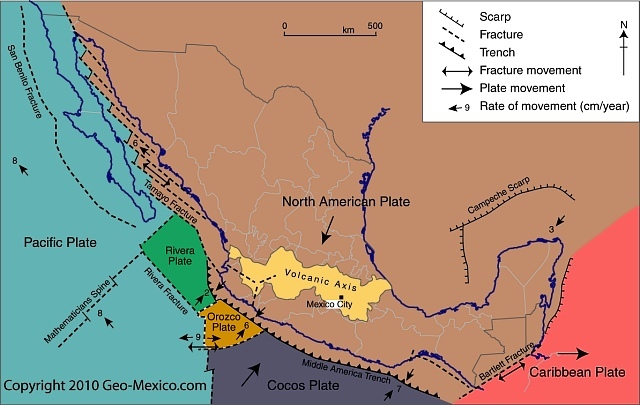 The area around the volcanoes is described in more detail in chapter 15 of “Western Mexico, a Traveler’s Treasury” (4th edition; Sombrero Books, 2013). In the past few days, Popocatepetl Volcano has continued to emit gas, steam and ashes, periodically shooting ash-laden clouds high into the sky. 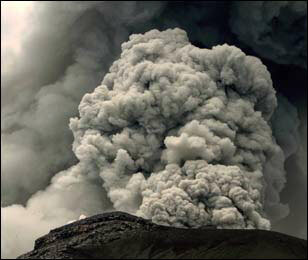 The columns of ash have risen up to 2500 meters above the volcano before drifting downwind. Depending on the wind direction at the time, light falls of ash have been reported from Mexico City (especially the Milpa Alta and Iztapalapa districts) and the city of Puebla. The National University’s Atmospheric Sciences Institute has developed atmospheric models taking account of the volcanic emissions and is releasing regular forecasts of where ash is likely to fall. Ramón Espinasa Pereña, who heads the Geological Risks department in the National Disaster Prevention Centre (Centro Nacional de Prevención de Desastres, Cenapred) expressed concern recently that Popocatepetl Volcano could be headed towards much more significant activity in coming weeks. 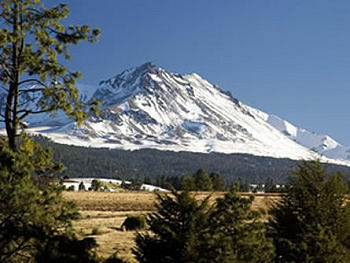 In an interview with Mexico City daily Excelsior, Espinasa started by saying that that the current level of activity is less than that experienced in 2000 when the volcano’s heat caused the melting of the glacier then found on the northwest side of the mountain. However, he added, the situation today is quite different. The dome of lava inside the crater of Popocatepetl Volcano has been growing, increasing the risks of a significant and possibly explosive eruption. In 1994, prior to the 2000 eruption, the crater of the volcano was about 800 meters long, 600 meters wide and 100 meters deep. The activity in 2000 raised successive domes of lava in the crater to within 20 or 30 meters of the crater rim. So far this year, the depth of the crater has remained about the same, but only because almost all the new material being added to the existing domes is being blown into the air. Experts are concerned that the high density of the magma beneath the volcano may lead to the existing vents being blocked. If this happens, pressure will build up underground and greatly increase the possibility of a violent eruption. Evacuation plans have been in place since 1994, and they have been modified and updated regularly since. There are ten major evacuation routes (see map). 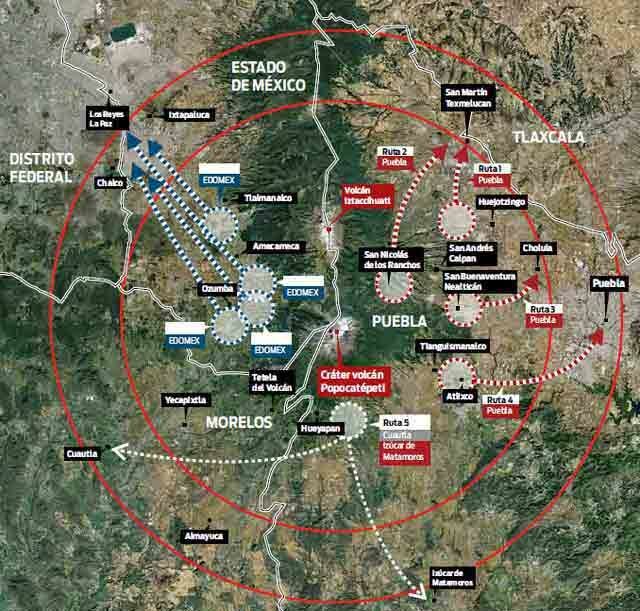 The villages most at risk (inside the 12-kilometer radius “high risk” zone) include several in the states of Puebla (San Nicolás de los Ranchos, Santiago Xalitzintla, San Pedro Benito Juárez, San Baltazar Atlimeyaya and Tochimilco), Morelos (Ocuituco, Tetela del Volcán, Yecapixtla, Zacualpan de Amilpas and Temoac) and the State of México (Tepetlixpa, Ozumba, Atlautla, Ecatzingo and Amecameca). Last week, the evacuation system (that will only be put into effect if the risk level rises) was tested with a large-scale practice evacuation in which the Mexican Army assisted municipal and state officials and emergency response crews. The practice has enabled authorities to improve the forecasts of precisely how long it will take to evacuate all villagers from the likely danger zone, in the event that the risk level is raised. Evacuation will not be easy. Some local inhabitants argue that the volcano has never caused them any harm, because, on the contrary, it is their “protector and guide”. They are unlikely to move voluntarily even if an eruption is imminent. They hold a festival each year on 12 March thanking the volcano for its rich soil, abundant rainfall and “to keep the volcano calm and happy.” The ceremonies include the placing of offerings part-way up the volcano, accompanied by folk dancing.